Welcome to “The Tropics,” where classic Beverly Hills charm meets contemporary and casual California living. When esteemed Production Designer Charles Infante envisioned 1710 Tropical, he approached the project as he would a script for a Taylor Swift or Lady Gaga music video or any of his many other visually stimulating spots, letting the home tell the story. The home is currently listed with Drew Fenton and David Kramer of Hilton & Hyland. Like an Old Hollywood tale with a modern twist, this 1930s original will take you back in time. Creating a unique and curated experience, no detail was left unturned from the custom deco crown to the unique rift oak screened stairwell. 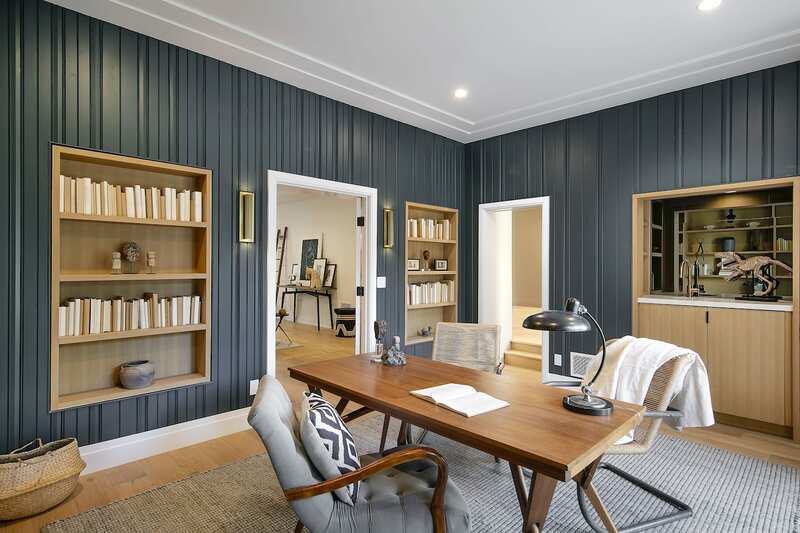 A complete makeover of the property ensued while “keeping the soul of the house very much alive,” as Charles explained. Tucked down a rare quiet cul-de-sac street, the secluded and beautifully landscaped hideaway instantly transports you away from the hustle and bustle of the city. 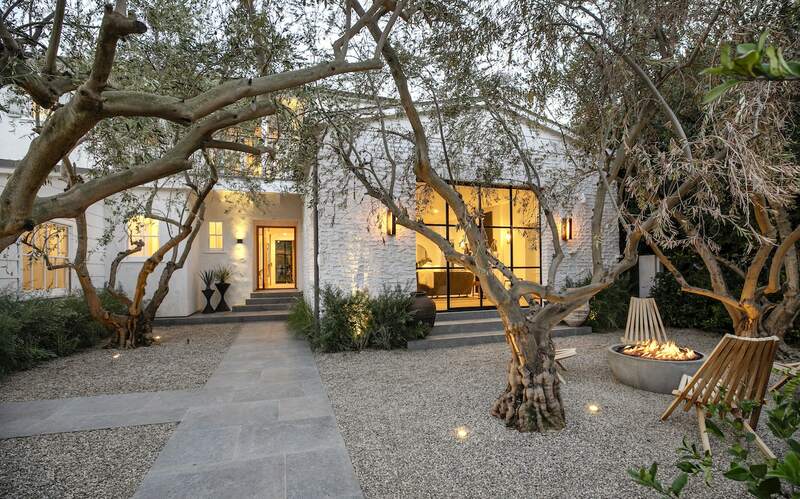 Step behind the elegant gates to a courtyard canopied with mature olive trees framed against the original Monterey Colonial brick facade with its unique weeping mortar. 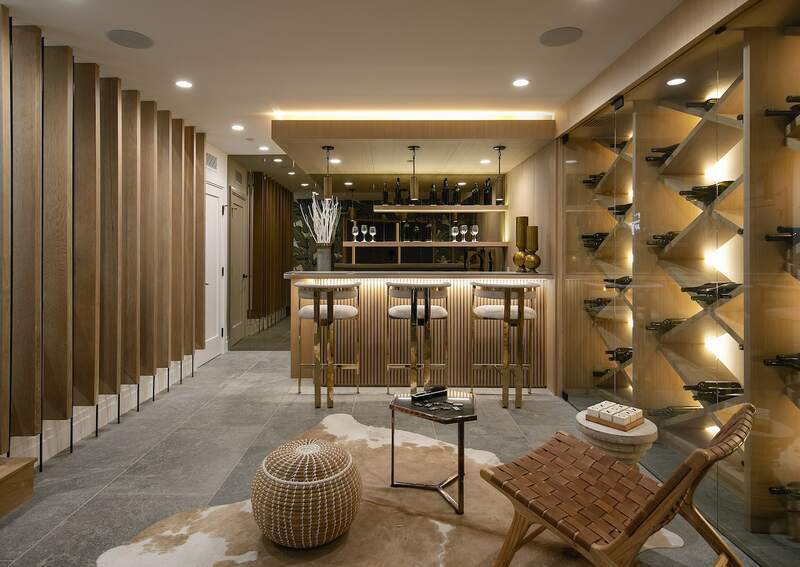 Inside, the open concept perfectly marries classic architecture, wide-plank oak floors, and beautifully proportioned spaces with a stunning fresh palette of chic amenities and high-end finishes designed for entertaining. 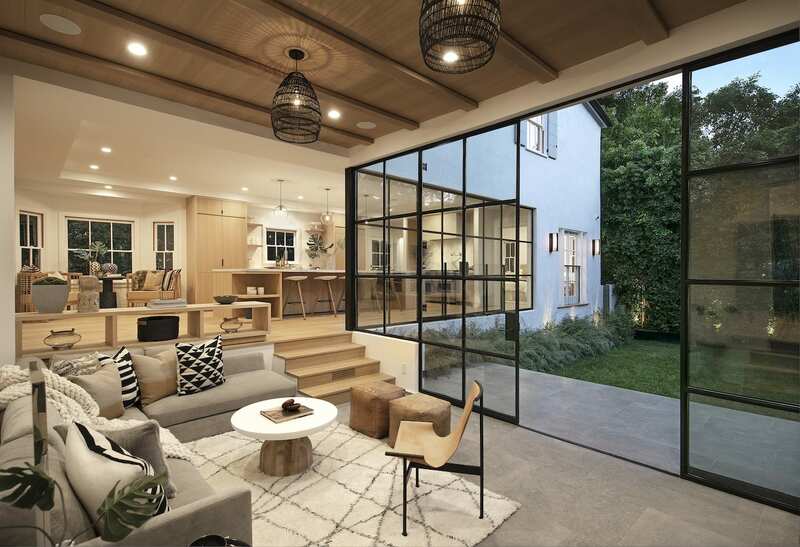 An abundance of natural light accents the warm texture of wood finishes, pouring in through the timeless steel case windows stretching from the kitchen to the sunken family room. From the striking original wood paneling in the den/office, to the beautifully appointed theater and bar, each room is a world unto itself. While researching inspiration for the home, Charles stumbled on “The Tropics,” a Rodeo Drive hangout for the who’s who of yesteryear, and loved how it tied full circle to the street name and vision for the house. Determined to pay homage to the extravagant Golden Era, Charles wants guests to feel like they are stepping down into an extension of the nearby Beverly Hills Hotel. A gorgeous bar awaits accented with strips of bronze mirror, a dramatic backlit floor to ceiling temperature controlled wine cellar, and a plush art deco screening room fit for the most discerning of taste. Refreshing for those seeking refuge from the city, enjoy resort-like amenities with an indoor outdoor flow throughout. Step out of the formal living room to a cozy fire pit within the olive trees of the serene courtyard to the rear grounds outdoor cabana accompanied by a fireplace, barbecue and entertainment deck surrounding the zero edge swimming pool “designed to feel like a piece of jewelry, not just a working tool you could use. Upstairs, the sun-soaked master suite is complete with rift oak beamed ceilings and closet, fireplace, bath full of sumptuous book matched marble, and a private terrace. Four additional en-suite bedrooms can also be found upstairs. A nod to its storied past and meticulously designed to showcase unprecedented craftsmanship, “The Tropics” offers an endless capacity for enjoying the ultimate Southern California lifestyle year-round. To learn more about The Tropics, visit 1710tropical.com.